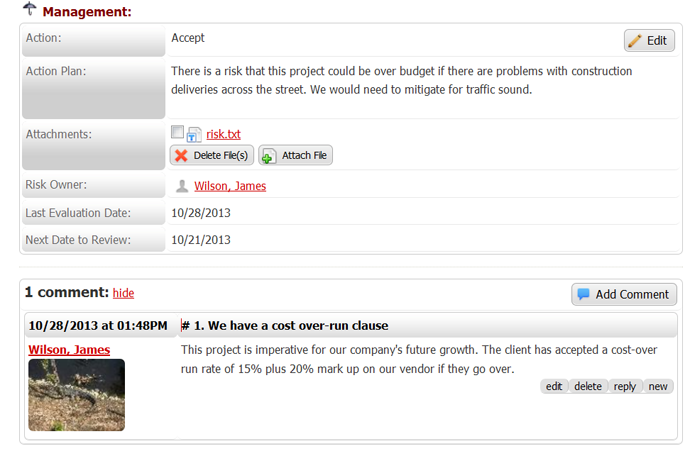 Same-Page eStudio's project management software includes a section specific to Risk Management. Here is how it works: People involved in the project can identify significant risks and assess the impact x probability of the threats by selecting a position on the risk grid. Doing so assigns a Risk Magnitude number to the threat factor. Project members should be encouraged to proactively engage in updating existing risks and identifying/communicating new risks. As new risks are added the Risk Register will provide an overview of known threats. On a regular basis your project team should meet to re-evaluate all the risks contained in the Risk Register and adjust the Risk Magnitude according to the actions proposed by the project leaders and project members. Comment on known threat for any device, anywhere, anytime. "I never understood how important modeling risks are in order a project to be successful. Everybody contributed and helped the project navigate a difficult situation because we knew what we had to do - it was in the Risk Register. It really help bring my project team members together." As a modern small and medium sized business, it is important that your organization is run like clockwork, ensuring that all resources are utilized to their full potential. eStudio Risk Management Software gives you visibility into a multitude of internal and external risks. Schedule a free webinar today so we can show you how effective eStudio can be in transforming your company. See for yourself why companies of all sizes and markets rely on the power of eStudio. It will convince you that using cloud software for creating and organizing risks online is the way to better decisions making. 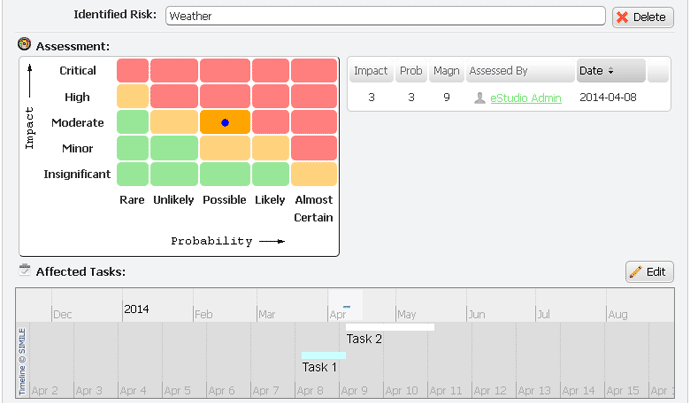 Are you ready to take eStudio's risk management software for a spin with a free 30 day trial?